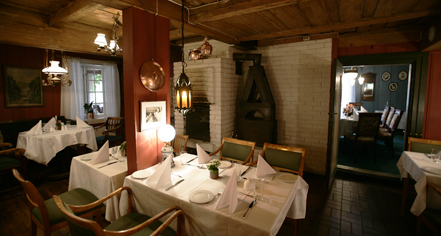 Whether seated under the broadleaf trees in the park or in a high-backed chair beside the large open fireplace, and thick stone walls dating from the 900s in the Gildehuset banquet room, dining at Sundvolden Hotel is a gastronomical experience combining basic Norwegian comforts with creative and innovative techniques. 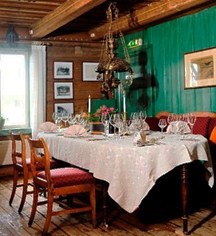 Sundvolden's a la carte restaurant, Anno 1648 offers tranquil surroundings and cozy intimate nooks to enjoy the divine creations of the chef. Representing the local and traditional Norwegian homemade cuisine, Sundvolden Hotel features an in-house baker and butcher to focus on supporting locally-produced goods using the freshest ingredients. Collaborating with local wineries, the cellar at Sunvolden offers carefully selected wines that perfectly complement the menu.